You’ve seen Steampunk moving closer to mainstream. There’s steampunk fashions, housewares, computer mods, guns, guitars, books, games, tattoos, and even and steampunk iPhone apps. 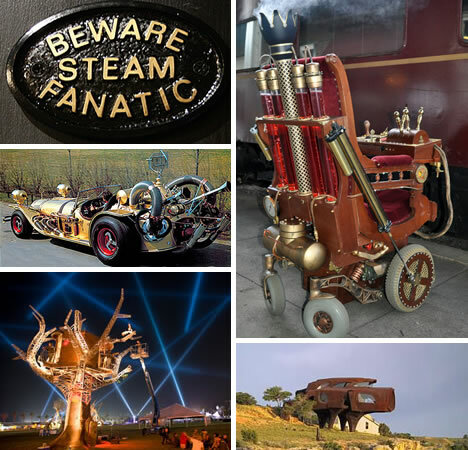 Steampunk themes are picking up steam and becoming increasingly popular. Some people drop buckets of money on car and home steampunk hacks. We aren’t talking about tiny tweaks like a little vehicle mod or a simple furniture fashion statement. 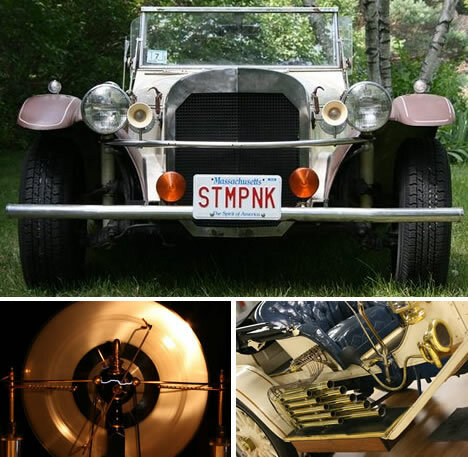 Here are 15 high-dollar hacks to thoroughly steampunk-theme cars and homes. Expert DIY steampunk hacker Jake von Slatt, of The Steampunk Workshop, mechanically tinkers in amazing ways. 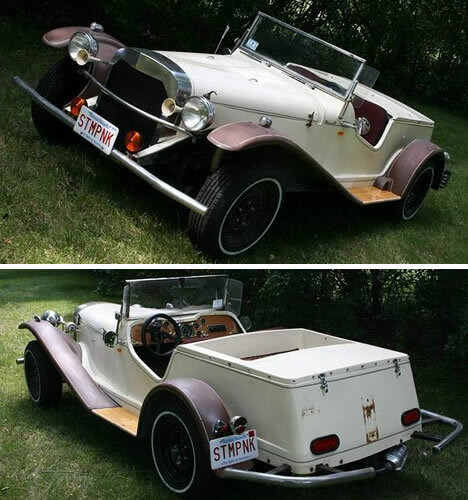 He also dabbles with eBay’s “Buy It Now.” That is where he bought a 1929 Mercedes Gazelle SSK replica made by Classic Motor Carriages. Since then, he’s making slow but steady progress from dashboard, wiring, and lights, to a catalytic converter on an air-cooled VW motor. 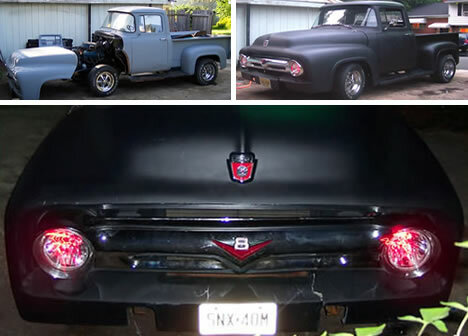 This is Datamancer‘s 1956 Ford F-100 pickup truck. “It’s dirty, ragged, fast, and dangerous…just how I like ’em. I’ve named it Papa Legba, after the Voodoo loa.” You can see where it started and then how it looked once it was lowered and painted black. Although this is a work in progress, at night the headlights glow a wicked red as if a sign of what’s to come. 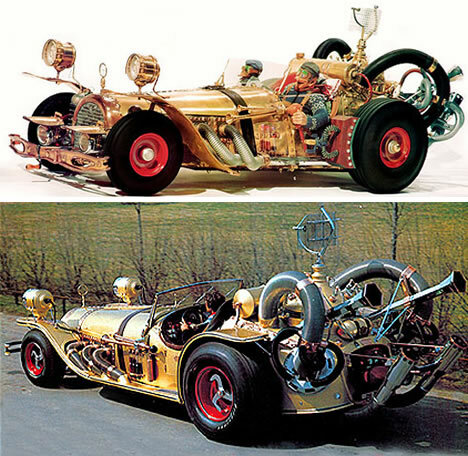 El Tempo Gigante is a full-scale replica of the racing car featured in the movie ‘Pinchcliffe Grand Prix.’ From the cranking handle to the exhaust pipe, this steampunked badboy measures about 22 feet long. It has two engines and weighs roughly around 6,000 pounds. It can accelerate from 0 to 62 mph in about six seconds. Jointly these two engines will produce a boost guaranteed to register 5.3 on the Richter scale. It’s loaded with tons of special equipment, from radar to a blood bank. 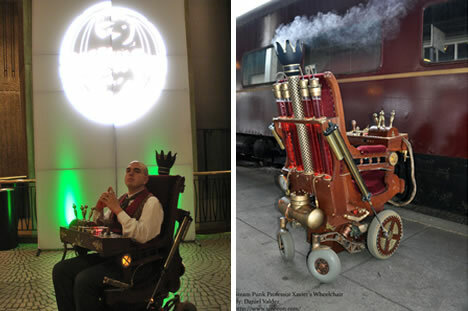 Steampunk Professor X Chair is what happened when designer Daniel Valdez modded a Permobil C300 Power wheelchair with a 1875 Eastlake Victorian platform rocking chair. 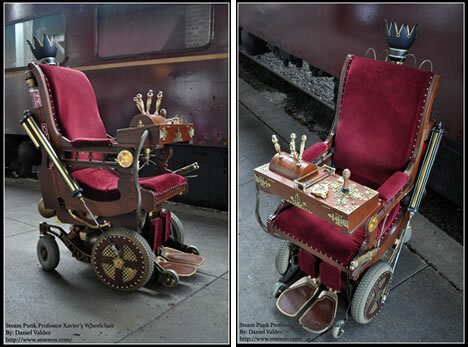 This chair “smokes” like it’s steam-powered but the steampunk hack didn’t end there. Valdez added a digital amped sound system, an event triggered sound processor, and even a Vodka cranberry dispenser. This is intensely cool to see in action like in the video above. 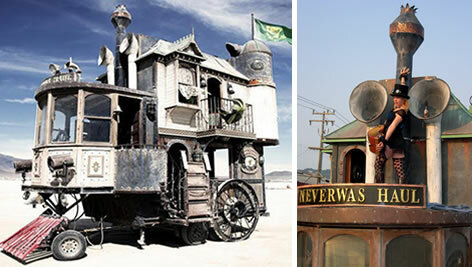 Built 2006 for Burning Man, in a celebration of “an era that never was,” this a 3-story Victorian mansion on wheels is the Neverwas Haul. It was built with 75% recycled materials, on the base of a fifth wheel travel trailer, measuring 24 feet long by 24 feet high and 12 feet wide. 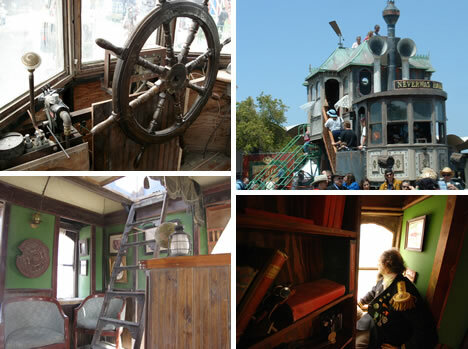 This Jules Verne-style vehicle is filled with steampunk artifacts. It very possibly may be the best Burning Man “art car” ever constructed. Seize the opportunity if you ever get a chance to see it. Themed props enable the home owner to escape into a 20,000 Leagues Under the Sea adventure. There’s an iris viewport like Captain Nemo used to for underwater viewing, an intercom box, navigation gauges, and Captain Nemo’s underwater rifle. The projector was designed to resemble the Magic Lantern. Ceiling beams were added to help give that Nautilus feel. Crafted in Switzerland, this Nautilus Home Cinema and Collection is the home owner’s “cinema deep under the sea.” Again the iconic iris viewpoint is a main focal point, but it also can be slid open to reveal the projection screen. Themed to feel like riding inside the iron-clad submarine, the collections and furniture pay tribute to opulent Victorian steampunk glory. 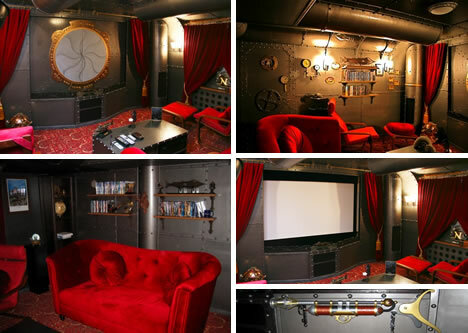 Both luxurious and spacious, about 900 square feet, this Nautilus theme home theater is shaped like a football with narrow ends and a wide center. It was built over the home owner’s garage addition, so you up before you go under the sea. The owners consulted 10 custom integrators in the Fort Worth/Dallas area before hiring one to undertake this 18-month project. 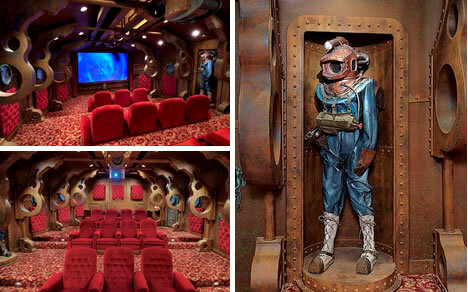 Our look at high dollar steampunk hacks would be incomplete without this custom $100,000 Steampunk Submarine Room. The rusting interior of this shipwrecked submarine comes complete with “plutonium-leaking” torpedoes. 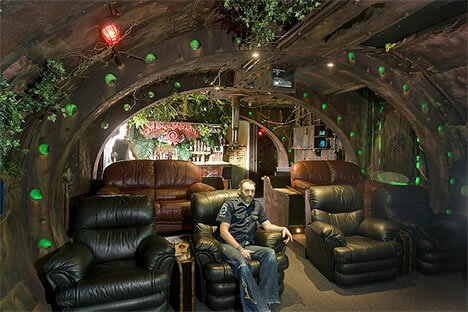 It also features a working periscope, a 3 meter big-screen TV, a kicking sound system, leather recliners, and a full-sized bar. To create games, people need to be able to think outside the box like at this San Francisco game company Three Rings Design. They hired Because We Can to turn their office into the Victorian submarine Nautilus without directly copying 20,000 Leagues Under the Sea or League of Extraordinary Gentleman. The mission was a success to make their office an amazingly fun place to keep and to attract top talent. 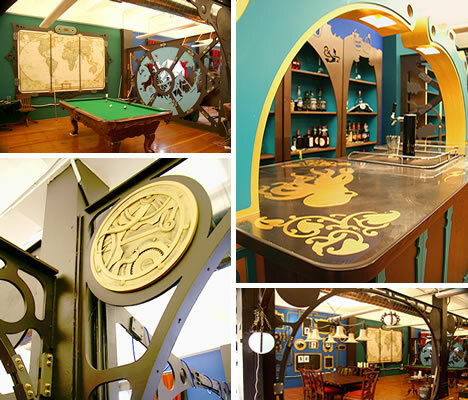 It seats 20, has a game room, an attacking octopus couch, a secret room hidden behind a bookcase, a pool table, and dozens of other steampunk and Victorian details. Oh yeah, they are now hiring if this is your idea of a dream place to work. 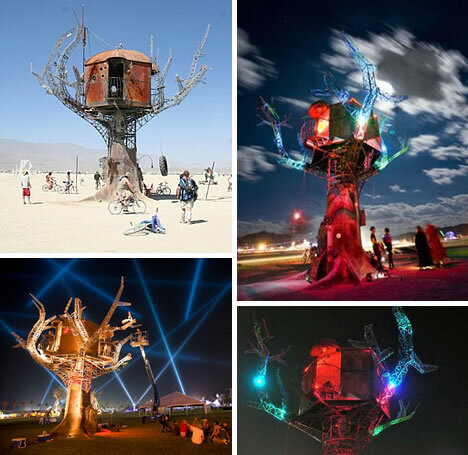 Constructed from clockwork components, recycled wood and steel, the Steampunk Tree House debuted at the 2007 Burning Man. This tree house weighs 8 tons, is 40 feet tall and 40 feet wide. The Steampunk Tree House comes alive at night when steam lines pump and nine aluminum organ pipes play unusual sounds. Solar panels provide power for an incredible LED lightshow. It includes firefly lights in the branches, mood lighting in the house, and floodlighting to showcase the tree at night. One of the great aspects of steampunk mods are that they are created from repurposed materials and refurbished into steampunk works of art. Master mechanical modder Jake von Slatt continues to astound people with his steampunk hacks. 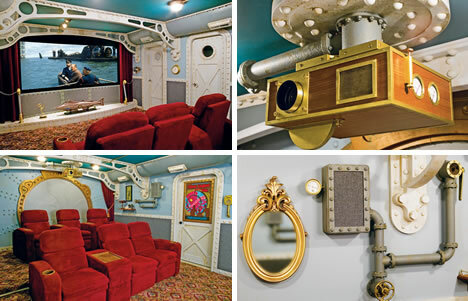 His Victorian-themed motorhome is absolutely awesome. 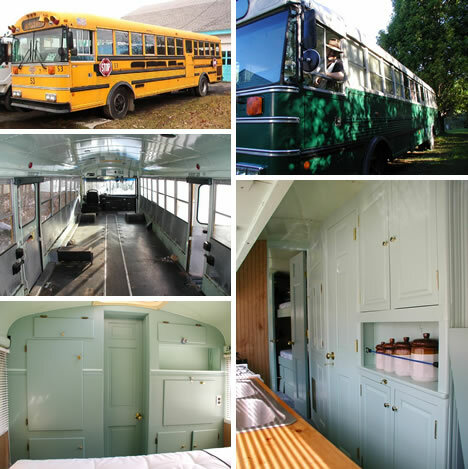 It started as an ordinary retired school bus that he bought for about $2,000. 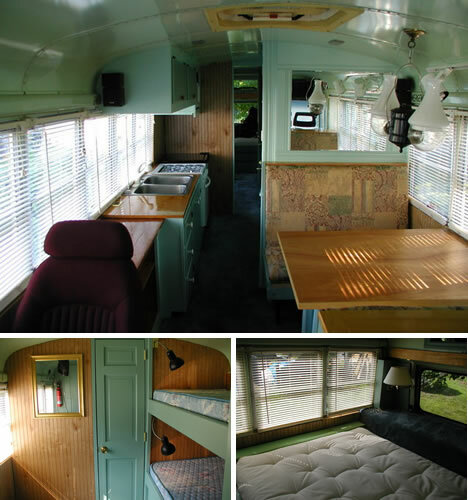 He then gutted it and upscaled it into this Victorian RV. You should really watch the video and read more from the always helpful and mind-blowing von Slatt. He shows his awesome project from start to finish. 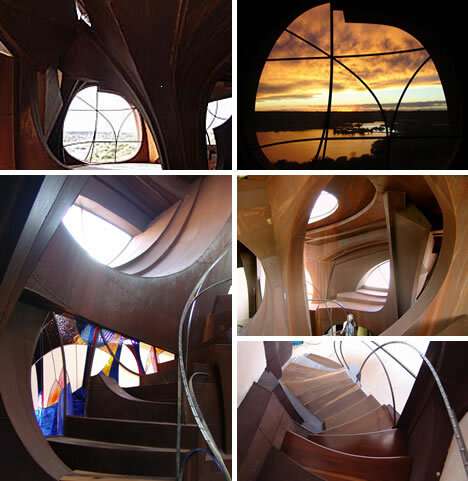 In 1973, Robert Bruno began sketching his sculptural home with an organic plan. He found the right location, an anomaly at Ransom Canyon near Lubbock, Texas. The architectural sculptor began building his huge steel home in ’74, changing plans and taking down walls as artistic inspiration led him. He completed construction on his 110 ton house in 1994. 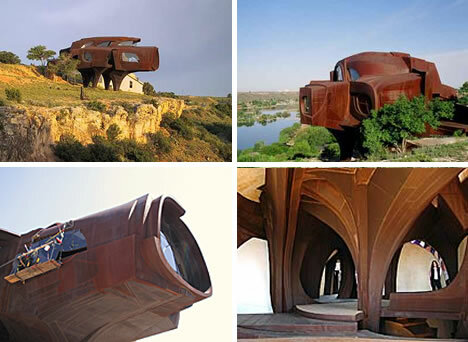 He not only built this steampunk home entirely by himself, but if he needed a special tool for construction then he created it. He constructed a crane on top of the house, controlling it with a switch, to lower him into position for welding and bending steel. The walls are either welded 1/4 inch plate steel or original stained glass creations to optimize light. 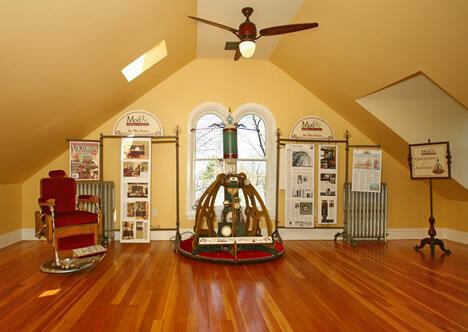 Bruce and Melanie Rosenbaum in Sharon, Massachusetts, specialize in Modern Victorian home restoration. 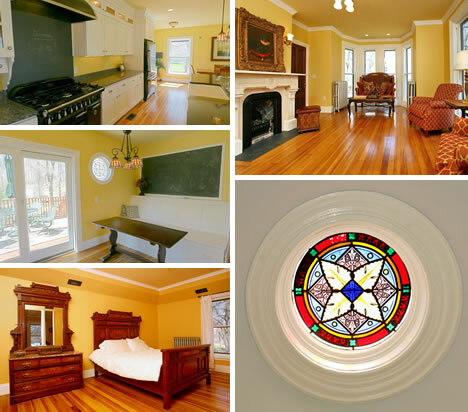 So they turned their Craftsman style Victorian, built in 1901, into a slice of steampunk heaven. 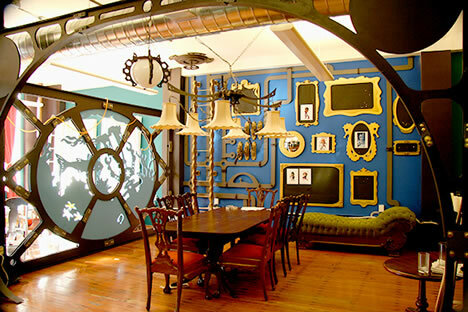 Their steampunked office is on the third floor in what was once the servant’s quarters. 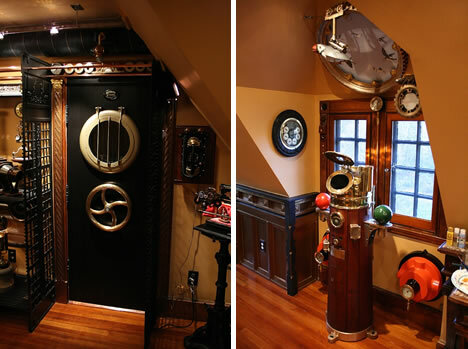 Little steampunk touches can be found throughout this home like the toggle light switches, Victorian heater, and a World War II battleship telephone. 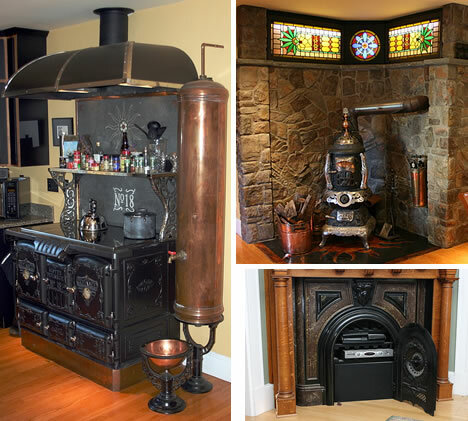 The restored cast iron stove actually houses a high-end electric Miele halogen cooktop. They have a plasma TV over their mantle. Hidden away in the fireplace are the controls for their surround sound system. A ship’s binnacle houses the household file and media server. More steampunk artwork is next to the submarine-like door. If you had a little dreamy sigh or perhaps had to wipe away the drool for wanting a steampunk home of your own, then this one is for sale. 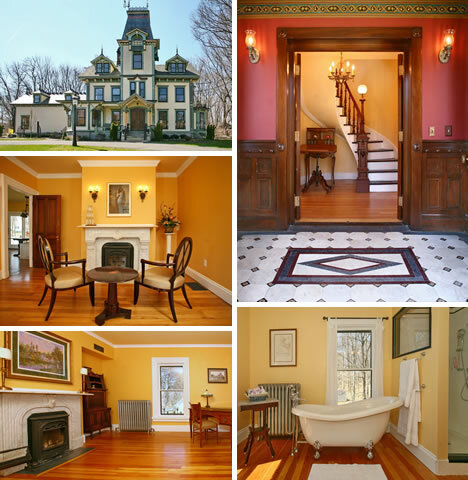 The Rosenbaum’s ModVic business is to restore historic Victorian homes built from 1850 to 1910. This house is located in North Attleboro, Massachusetts. It has the original Victorian character and rich beauty. 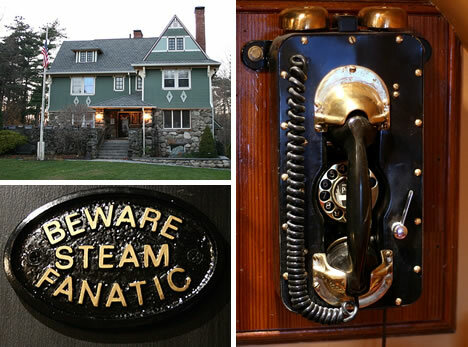 Yet even with all this opulent charm, it has completely new systems that make it a “new old home.” You can take a virtual tour of this fully furnished steampunked house. Buying it will set you back a little less than $900,000, but it’s another amazing steampunk mod and high-dollar hacked home.